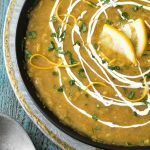 Instant Pot Red Lentil Curry Soup is a very flavorful Indian inspired recipe. Using split red lentils speeds up the cook time and makes a nice texture. 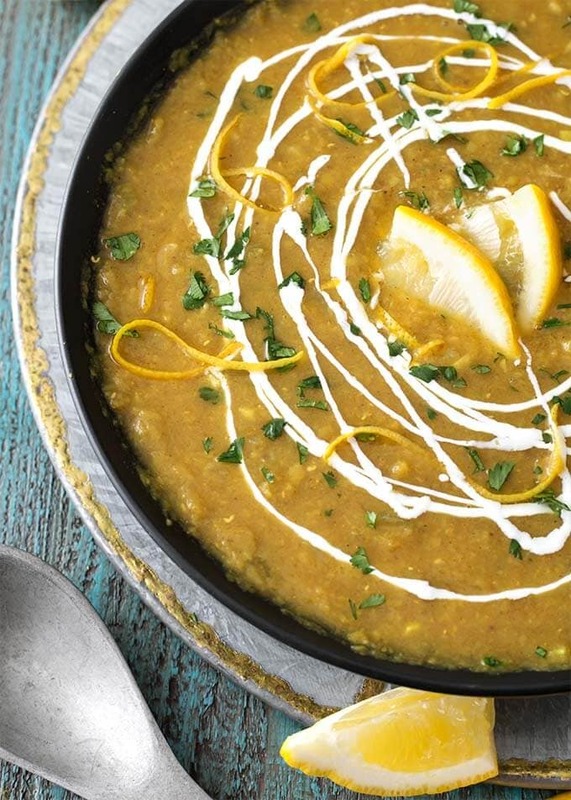 Pressure cooker red lentil curry soup is warm, slightly spicy, and very comforting. The warm spices of a curry dish are among the most comforting to me. Add them to a soup and you have comfort food in a bowl! 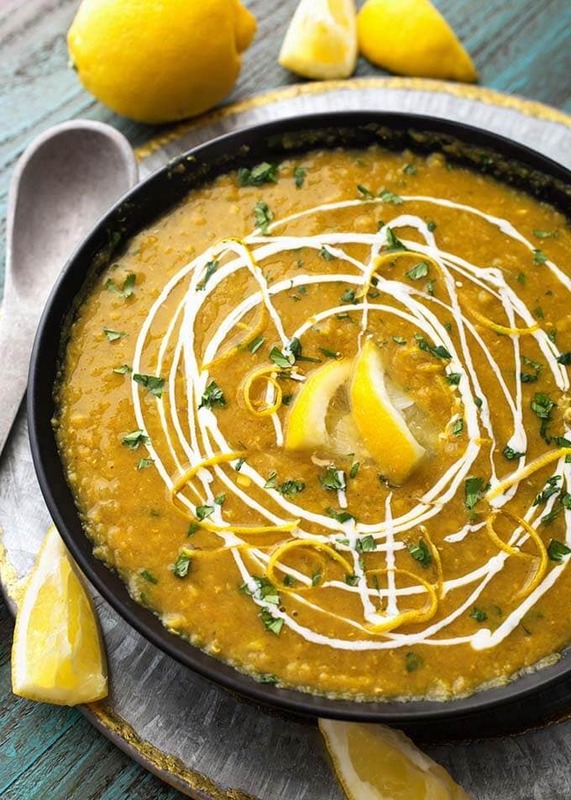 This recipe is for Instant Pot Red Lentil Curry Soup. A dish I had at a bed and breakfast on one of my trips to Utah. I fell in love with the rich flavor of the warm spices in this soup. There were no big chunks of vegetables, and no meat, but it was so satisfying. I asked the owners for the recipe and they happily gave it to me. Gosh, how can that be over 25 years ago already?! No matter, it is still a favorite. I decided to adapt this recipe to work in my Instant Pot®, and it does nicely, with just a few adjustments. It cooks faster, too. Pressure cooking soups is nice because the flavors of the aromatics and spices get infused into the broth. The liquid doesn’t evaporate, so the nutrients stay in the soup. Added bonus! The cook time for this soup is about 45 minutes on the stove top. In the pressure cooker it is only 8 minutes under pressure. This is after the sautéing of the vegetables and spices. Not bad! 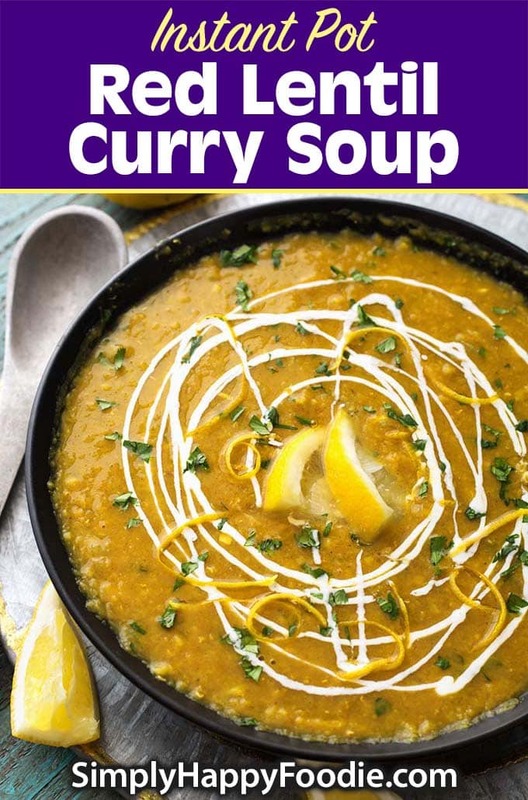 Instant Pot Red Lentil Curry Soup is a very flavorful Indian inspired recipe. Using split red lentils, it is warm, slightly spicy, and very comforting. Turn on the pot's Sauté setting. When it is hot, add the olive oil, onion, and bay leaves. Cook, stirring occasionally, until the onions just start to turn translucent. Add the ginger and cook, stirring occasionally, for about 4 minutes. Add the garlic and jalapeño, and cook, stirring constantly, for about 1 minute. Add the curry powder, cumin, cinnamon, and salt. Stir constantly for about 20-30 seconds. Add the broth and the red lentils. Stir and scrape the bottom of the pot to be sure nothing is stuck on there. Press the Pressure Cook/Manual button or dial, then the +/- button or dial to select 8 minutes. Pot will take several minutes to come to pressure. When the cook time is finished, let the pot sit undisturbed for 10-15 minutes (natural release), then turn the steam release knob to the Venting position to release the remaining steam/pressure from the pot. When the pin in the lid drops back down, open the lid and gently stir the soup. Stir in the cilantro, lemon juice, and chutney. Taste and adjust salt, if needed. Use an immersion blender to make soup extra smooth. Serve hot with a drizzle of yogurt and more cilantro, if desired. Very good soup. I added some cauliflower for extra nutrition and thickness.